As a fish lover, you decide to own your own fish tank or aquarium for the first time to have great attachments with your fish pets. This becomes a great feeling of excitement, and the euphoria begins to build up as you set out to be a beginner fish tank owner. The excitement is quite understandable, and it makes you want to do everything right before you get your self the best fish tank for beginners. A beginner with little or no experience needs all help they can get when trying to shop for the best fish tank for beginners. This is why it is essential to focus on the details required to make your dream of owning a fish tank a reality. Choosing the best fish tank for beginners can be a daunting task as a vast majority of brands are out there in the market, but there is need to consider the following before choosing the best fish tank for beginners. The size of the fish wanted: It is highly imperative that you consider the size of the fish you want before choosing your type of tank. This is because you also have to consider the space it will take in the house and how it will perfectly allow your fishes to grow without hindrances. How strong and durable the Glass is: This is important because some tank comes with not so strong glass which can easily break, so be sure to know the glass thickness when buying your fish tank. 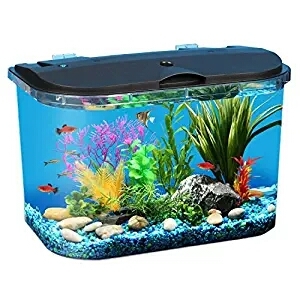 Place to Keep the Tank: You want to pick a visible position that is not in so much direct contact with sunlight and be sure to keep the tank away from doors and windows. If you choose to get yourself this product be assured that you are getting one of the very best tanks for beginners and it promises an all in one kit for starters. This 20 gallon glass aquarium from Tetra comes with an LED hood, a tetra HT 20 heater, a whisper 20 filter and best of all the beautifully made several aquarium plants. You can get this product in several different sizes that ranges from 10 to 55 gallons and you can be sure about the temperature of the water in the aquarium because of the digital thermometer presented with the aquarium glass tank. There’s the presence of fish net, filter media, water conditioner and plenty other benefits that will make your fish live a healthy life. The product’s glass is made to be sturdy and it is covered by a life style warranty. The downside to this product is it the filter is not as strong as expected but if you are running on a low flow there won’t be a problem. You will get to see this nice and durable product in different sizes like 5, 10 and 20 gallons. The Marina LED aquarium kit is one of the best products in the market for those just venturing into the aquarium business or lifestyle. The product presents a clip-on filter that is assembled by a quick change filter cartridge. This is present for easy and smooth filtration of the aquarium tank water. The LED light present at the hood of the product is there to give a beautiful glow into the fish tank. There is the presence of biological supplement, conditioner, fish net and fish food with this product. The downside to this product is the unavailability of the fish tank in sizes above 20 gallons. This aquarium fish tank is a little below the other tanks in the market in terms of comprehensiveness. However, it is still a great buy for any beginner. 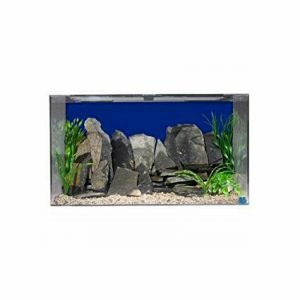 The product is presented with an acrylic aquarium, and this has a high impact resistant and is much stronger than the normal glass aquarium tank. The size of this product varies from 20 to 50 gallons which tells you this is a large tank compare the others reviewed so far. The 24-inch light reflector does well to illuminate the tank with brilliance and beauty, the light reflector is made to have a coloured backdrop also. You can bank on the durability of this product at all times because the acrylic tank has more resistance than the glass tank. The downside to this product is the lack of a water heater or filter. This is a product with a unique bowfront design that is presented with a beautiful LED light supplier as the name sounds. The Aqueon deluxe LED aquarium kit will display your fishes in the most beautiful way possible. The Aqueon Deluxe aquarium tank is presented in different sizes ranging from 16 to 26 to 36 gallons. The glass tank feature is presented with a curved front panel and the low profile LED light is also there to make the aquarium look at it best. The product comes with a submersible heater and power filter system. Other accessories presented with this product are the fish net, fish food, and the water conditioner. This is a product that will give you great value for your money. The only negative to this product is the fact that the hood can only accommodate the LED light and not any other light. This is a product with a unique design that helps to hide the wiring of the product and the tank equipment. For beginners who prefer attractive tank, this is the best option in terms of the attractive look. 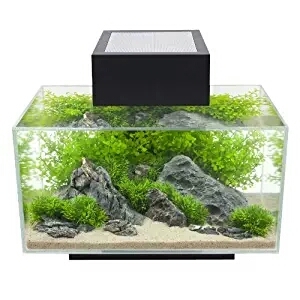 The Fluval Edge aquarium kit includes a six-sided glass aquarium as the name implies and this allows for a 360-degree view into the aquarium tank. 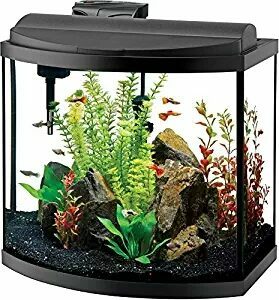 The product features an LED lighting, Fluval power filter plus the filter required to filer all media. The ease of access to this product is top notch, and you can easily maintain the product as a result of this. This product does not produce noise as it runs very quietly. The product is compact and won’t take much of your space. However the product does not come with a complete kit, and the lid makes it a little hard to clean the tank. This is one of the best tanks out there for beginners, and it is a lovely tank to start with. The LED lighting feature illuminates the aquarium brightly and beautifully. You can be sure of the durability of the product as it comes with a unique design from the manufacturer. 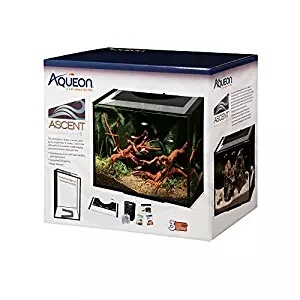 Aqueon Ascent LED Frameless Aquarium Kit is presented with kits that will make your experience with the tank lovely. The product is supplied with nets and filtration system that will make your tank water clean at all time. This is a 50-gallon water fish tank that will wow you with the cube design. The product is supplied with large storage space, and it is one of the heavy duty tanks for beginners in the market. If you are worrying about cracks or leaks, this is the product to buy because it is highly durable and would not easily crack or break for any reason. The tank is well supported by the cabinet, and this gives it a level of balance that one can bank on. The filter system is highly durable also, and this gives you a one of a kind type of filtration. 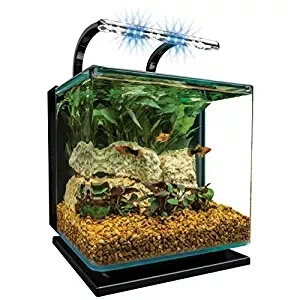 This is one of the best beginner-friendly fish tanks in the market, this product will show off your fishes in a beautiful bright light during night and day. 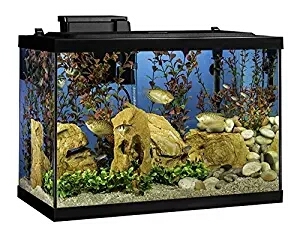 The Marineland contour glass tank aquarium kit is made with a unique and sleek design; this is one of the best and ultimate desktop tanks. The product comes in 3 and 5-gallon sizes respectively. The glass tank is made with a crisp glass, and it has a rounded edge which makes it have a unique appearance to the sight. 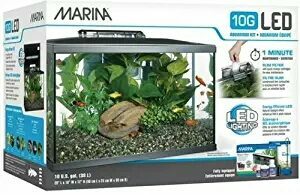 The product is presented with a three-stage filtration system, the LED light feature is energy efficient, and you can bank on the hinged glass lid for easy feeding and cleaning of the tank. 9. 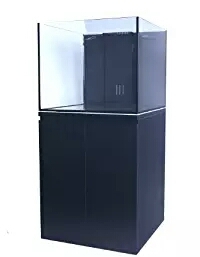 SeaClear Acrylic Aquarium Combo Set. 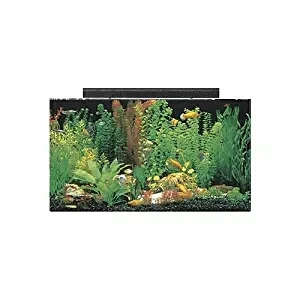 This fish tank for beginners is one of the oldest and most trusted fish tanks in the market, the fish tank is presented with an acrylic makeup which makes it stronger and durable for use for beginners. The product comes in a series of sizes from 15 to 50 gallons; the construction of the product is from a break-proof acrylic. This is a product that will guide against leaks, and it is best for freshwater or saltwater aquarium. For starters, this will give you a feeling of assurance that your fishes are safe and you can bank on its qualities to have the best experience with this beautiful fish tank. The shape of the product is unique, and it allows for an easy peak into the tank, and it gives a wonderful display of the fishes. The LED light is us unique, however; some users have complained that it doesn’t last long. The filter system is great, and you can be sure to have your tank’s water purified with this. As a beginner aquatic lover, the feeling around you is euphoric, and you just want to make use of the pumping adrenaline to immediately set up your fish tank, and sometimes some mistakes come with that. However, the whole essence of this review article is to help you guide against such occurrence which is why we have done so well to ease you off the stress by listing out the ten best fish tanks for beginners. Following the above set guidelines will help you a lot going forward in your quest to have the best fish tanks for beginners.